This beautiful gardening book--full of lush photographs and insightful commentary--will surely give readers some new ideas for their home landscaping projects or Bali travel plans. Born of volcanic eruptions many eons ago, Bali is still in the throes of creation as man and nature continue to transform its landscapes. Balinese Gardens presents a unique portrait of the lush volcanic landscapes and gardens found on this magical isle--gardens which are further enhanced by traditional ornamental sculptures, tranquil ponds, fountains and sacred springs. Landscape gardener and author William Warren introduces Bali and examines the effect its landscapes have had upon notable visitors over the past century. Specialists in Balinese ecology and culture then provide a broad overview of the island's geography and plant life, including some fascinating insights into the role of nature in Balinese culture. 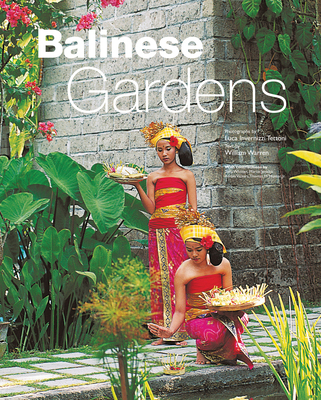 The second part of Balinese Gardens explores Bali's finest contemporary gardens in private homes, resorts and restaurants around the island, detailing the wealth of plant life, design and decoration that thte island has to offer. Lavishly illustrated with over 300 photographs by renowned photographer Luca Invernizzi Tettoni, this book is a delight for anyone with an interest in tropical plants and landscape design as well as everyone who has been entranced by the natural beauty of this remarkable island. William Warren has lived in Thailand since 1960 and has designed gardens in Bangkok, Chiang Mai and Phuket. Additional chapters are written by Tony Whitten, a Biodiversity Specialist at the World Bank in Washington, DC, and Martin Jenkins, a freelance writer and researcher on environmental and conservation issues worldwide.